Yesterday I knit like a fiend, after I suddenly realized that really, it's not a joke. Your baby will not be born until his/her shawl is finished. I know that it might sound funny to you, my belief that babies don't come until their knitting is done, but I have a lot of babies to judge by and a perfect track record. The girls were each born (one two weeks late, one two weeks early and one right on her due date) all on the day that their blankets were finished, Hank was born on the day I finished his blanket, Snowdrop didn't come until I finished her shawl, Sam arrived in 49 minutes once I was done with that boring baby blanket (though I feel bad that he was a week late. It was a pretty big blanket though.) .....I don't know why I was worried. Clearly, the baby comes when I finish. "Emma may have miscalculated her gauge." We ripped it back last night. I tried not to think of the irony that I was delaying knitting your shawl while ripping back the only item in the world that is going to fit you if I don't finish the shawl. Wracked by guilt, I knit on the streetcar, on the bus and until 1:30AM, when...I finished the knitting. I know what you are thinking. You're thinking "It's 10:30AM Steph. It's been (*&^%$#!!!! nine hours since you finished! Why the (*&^%$!!! am I still *&^%$#ing pregnant?" Firstly, don't talk like that, the baby can hear you, and secondly...because lace isn't done until it's blocked. 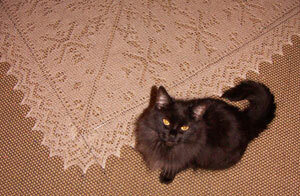 The knitting was finished, the shawl was not. 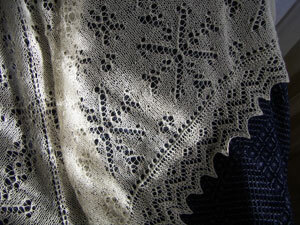 Knitting done, I folded the shawl, relieved that I would be blocking it today and turned in. Lying there, my dear friend. I started to think about you. I though about how you were trying to sleep while someone jumped on your spleen, kicked you in the diaphragm and played rousing games of "I'm sure that's her bladder" so you had to get up to pee 57 times while I was lying there. I felt sort of bad. So I got back up. 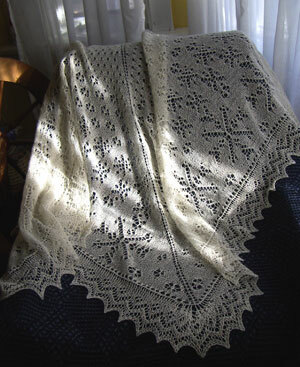 By the time I got up this morning the shawl was dry. (I woke up twice last night imagining you calling me in a rush, and me staggering around the living room with my coat half on, cab at the door, kicking pins out of the thing at 5:55am ..but no.) I unpinned it and lo. It is knit. It is blocked. It is dry. It is ready. Specs for my knitter friends: My own pattern, with the final snowflake pattern and border boosted from this book (which is a fine book.) 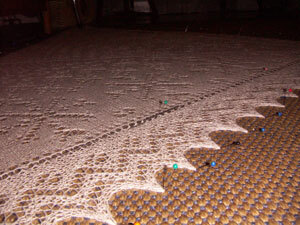 It took 2 full balls and a little bit of a third one of Misti Alpaca Lace. (437 yards/ball) on 3.75mm needles. 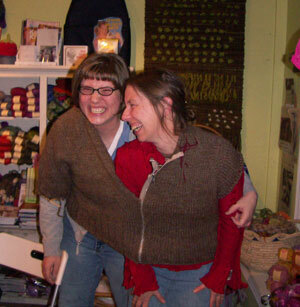 Teresa, please forgive me for not knitting as quickly as I could, and accept my deepest apologies for that last stretch mark that was probably completely preventable. Mea culpa. Know that despite my regrettable lack of speed, I will point out that I am actually done on your due date, that this is one of the best and most beautiful things I have ever knit, and that I couldn't possibly be more excited about being at this birth, touching the third of your babies (you do such nice work) ...and finding out exactly who is in there. In short, my dear friend....Bring it on.